I had this lovely goal of writing something super poignant for my first post of 2017, but man. I am so busy that my brain doesn’t have a lot of space for poignant. So instead, I thought I would do my yearly “What I Read” post. I took the GoodReads Challenge again, but I set my goal for 35 books. In 2015 I set my goal for 25, but ended up reading 35, so I figured I could do it again. I surpassed the goal handily by reading a total of 44 books! It helps that I love Young Adult Lit and some of those can be read super fast. In fact, it’s only January 6 and I’m already on my second book of the year. Anyway, this is the list of books I read last year in the order I read them. The ones in BOLD are the ones I recommend (although there were only a couple I was “meh” about, so go ahead and check them all out and let me know if you read them and what you think. The ones wit (YA) are young adult lit. (P) are novels that are written in verse/poetry. (N) are nonfiction. For Christmas this year, I was given a few gift certificates for books with explicit instructions to spend them on books I want to read for myself, and not necessarily something to add to my classroom library. It’s so hard for me to choose to spend my money on adult contemporary or nonfiction knowing that while I might enjoy it, it probably won’t interest my 8th graders enough to put in my classroom. But there are lots of books I want to read that fit these categories. So I did it. I went out and bought five books (and was gifted one) that are just for me. My goal is to roughly go every-other with YA books and adult or nonfiction books. Of course there are still YA books I would LOVE to add to my classroom library, so if you are feeling generous, you can always check out my classroom library Wish List that the students and I create. I set my 2017 GoodReads goal to 40 books. I realize maybe I should take a risk and set it at 45 since I read 44 this year, but I tend to be conservative in my risk-taking. Like I said, I’m already on book number two for the year. I have to read just over three books per month to make my goal. I think I can do it! Tell me, what should I add to my 2017 To Read List? The book Open Boxes by Christine Organ is not just another feel-good book meant to tell you how to connect with your inner spiritual flower child. It is an inspirational collection of essays that demonstrates how our every day lives are filled with beautiful grace, amazing wonder, and incredible miracles. 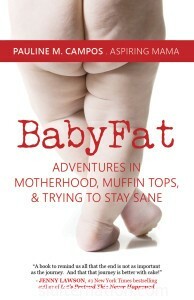 I will admit when I read the description of the book, I figured it would be one of those hippie-dippie books that gives me instruction about how I can meditate and self-love my way into a happier, calmer life. I was pleasantly surprised to find out it wasn’t so much didactic as it was inspirational. Organ postulates that our lives are like a series of tightly sealed, organized boxes that we file away, keeping separated from other parts of our lives. In order to lead a more connected, spiritually peaceful life, we should open those boxes and make connections. She organizes the personal essays in the book into the three ways she imagines the boxes being opened and shared: Grace, Wonder, and Miracles. Early in my reading, I found myself grabbing for my pencil, marking up the book as I read, dog-earring pages to come back to. Rarely do I identify so much with someone else’s spiritual journey. Mine has always felt very unique in that it all took place–is taking place–in my own head. Organ’s journey is very similar in that she embraces her doubts. “We have doubts and questions. We see inconsistencies, and there are times when we don’t know what to believe. But there is no shame in admitting the presence of spiritual doubts. In fact, acknowledging doubts is a critical part of an authentic faith” (73). She also recognizes the need to be vulnerable and take chances in order to be our best and produce our best. I struggle with this in my writing as well as in my teaching, mothering, and wife-ing I know that in order to do the great things I have dreamed about my whole life, I have to open myself up. I have to allow mistakes and criticism. But it’s so hard. Organ says, “The prickliness of vulnerability is a touch of pain accompanied by the feeling of freedom that comes from having done something truly authentic, personal, and unabashed” (61). The other areas of the book, Wonder and Miracles, are no less inspiring. “Sometimes the weight of wonder is just too much, the awe too overwhelming, for me to grasp” (127). From her faith journey to her struggles with vulnerability to her miscarriage and learning to embrace self-care, I kept finding more ways to personally connect with Organ. But probably the most significant connection I felt to her was in the way she describes wonder and miracles. Every day I marvel in wonder at a million things, but at the top of the list are my children. Not a day goes by that I don’t run my fingers over Alice’s sleeping face or Charlie’s fingers or through Eddie’s hair. The fact that I have them is a miracle, and watching them grow and learn is a wonder. She even touches on prayer in the Miracles section, but it’s not in the way you think. Organ does not talk about times she prayed for miracles and they happened. Nope. Instead she discusses the “tricky” nature of prayer–who is it really for? What is it supposed to do? She muses that prayer is not for changing circumstances, but for giving the person doing the praying a different perspective on those circumstances. For providing a peace. She even likens prayer to a form of therapy. If you are in a funk emotionally or spiritually, I recommend Open Boxes. Even if you are not, it’s a lovely read that will reaffirm what you know and help you to believe in the miracles and wonder of this world we live in, this life we have been graced with. It will help you mentally open boxes and see all the ways we are all connected. 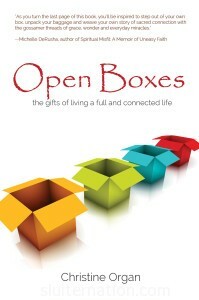 Open Boxes is available at both Amazon and Barnes & Noble. Disclaimer: This is not a sponsored post, nor are the links affiliate links. I was sent a copy of the book to read and review, but all opinions are my own.